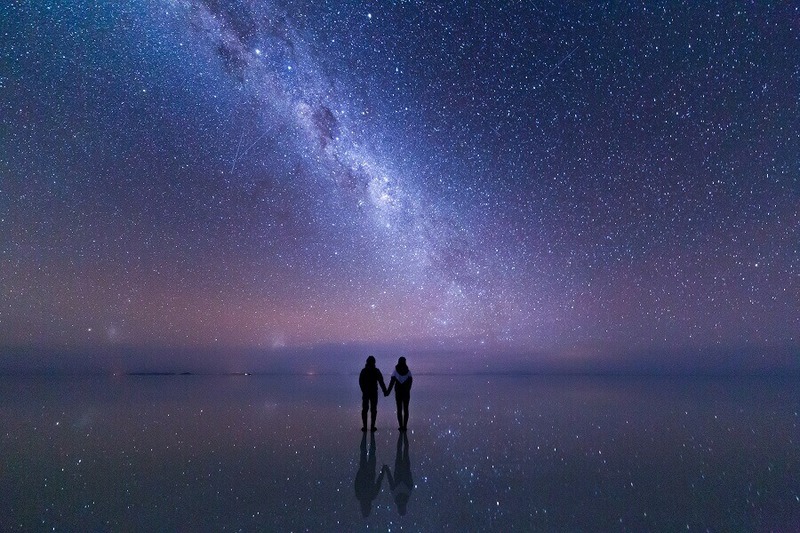 An Uyuni stargazing tour is an amazing choice if you are planning to get out of the city to take a closer look at the stars or if you are looking for a heart-melting romantic experience. Just imagine it, stargazing with that person who is a “sky full of stars” for you, in a place where “stars and salt collide“. Our stargazing tours are combined either with a sunset or a sunrise over the salt flat. 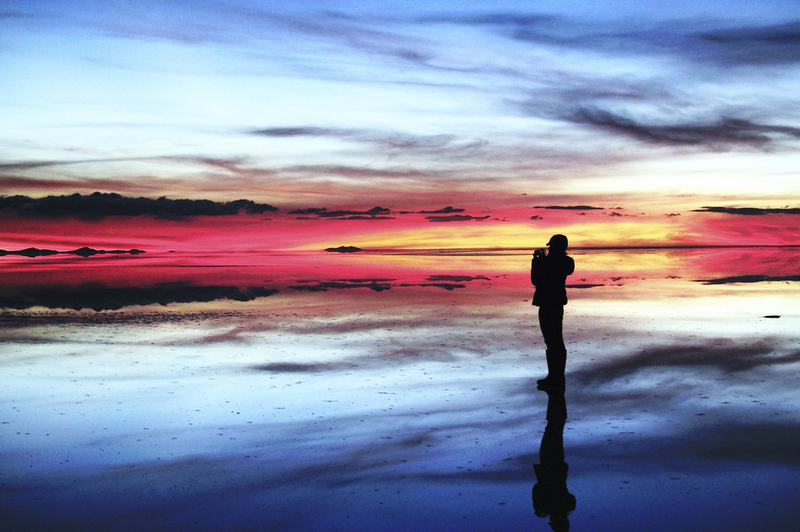 Experiencing a sunset/sunrise over the Salar is an unforgettable and romantic moment. 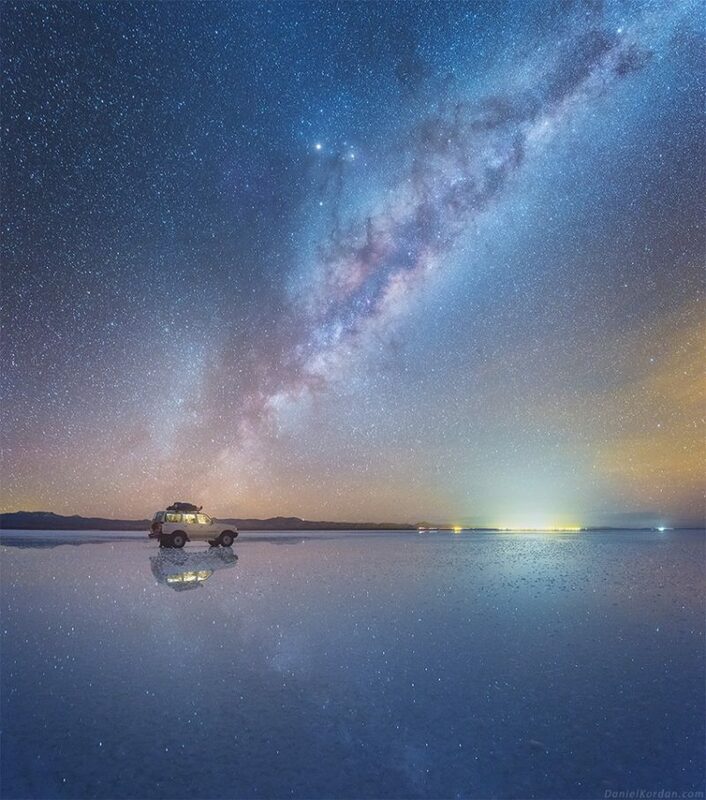 The Uyuni salt flat is a stargazing centre out of this world! (Check the best places to stargaze) The lack of light pollution (this light pollution world map shows the concentration of light pollution), clean air, wide night skies and visually breathtaking amazing surroundings of ethereal white beauty and wide horizon make this place one of the best star gazing destinations in the world. 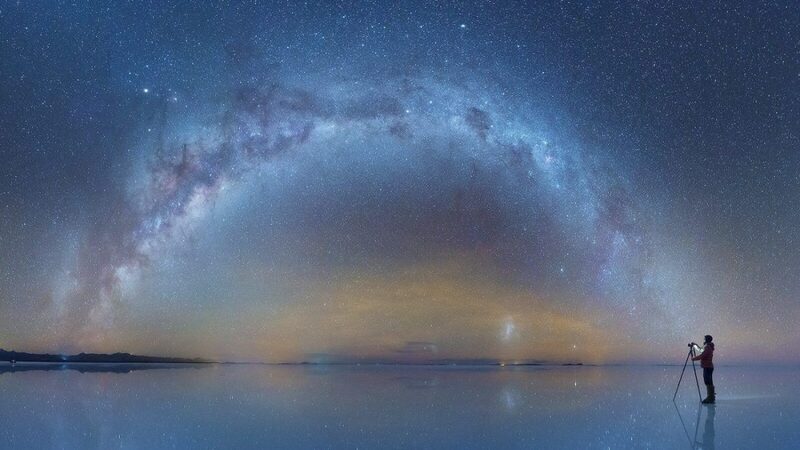 The white salty surface is highly reflective and when it floods during the wet season (From December to May) the thin layer of water creates a mirror reflection of the night sky above. You can see the sky reflected at your feet. It’s like floating in open space! 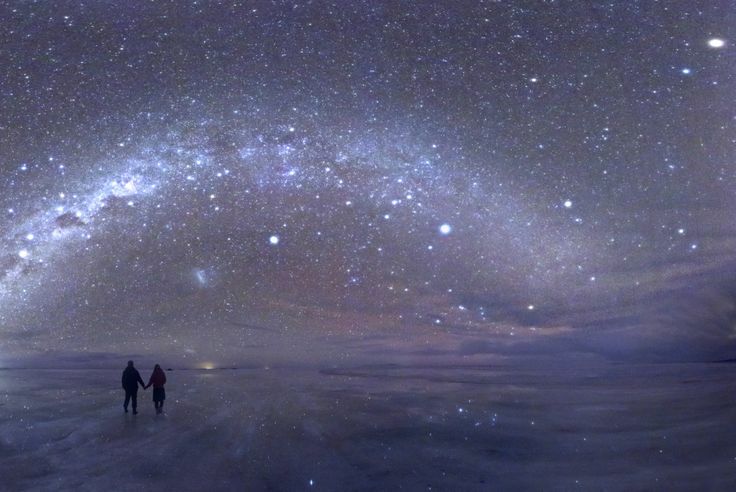 Our private stargazing tours on the Uyuni salt flats take place all year-round and only on demand. Preferably avoiding to operate if it’s raining or during full moon as due to its brightness the visibility of the stars is not very clear. Please check the Lunar calendar Bolivia and our stargazing planner. So which phase of the moon would be best for stargazing? The best phase of the moon for stargazing depends on what you want to do. Some enjoy watching the moon itself. On the other hand, people using telescopes avoid the moon because its glare interferes with deep-sky objects. The ideal situation for most people looking for a sky full of stars should be a new moon (also called the Dark moon) night with few clouds. 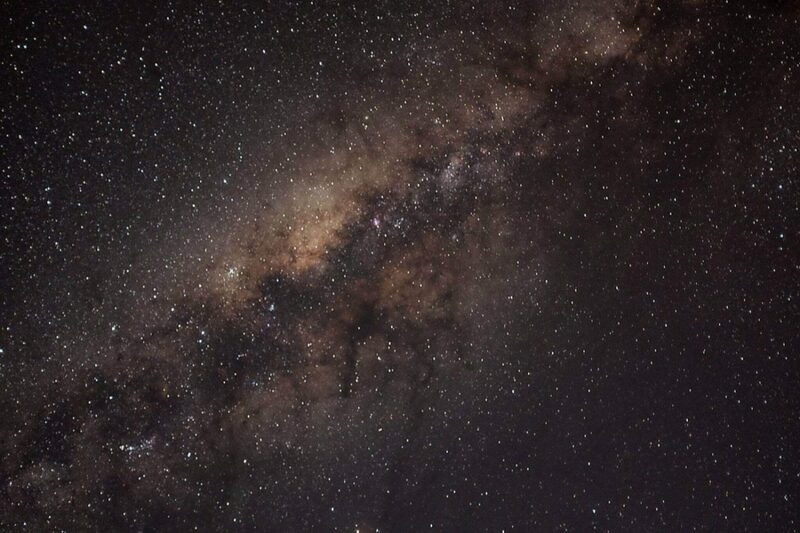 The Milky Way, the Magellanic clouds (distant dwarf galaxies), Saturn and Jupiter are commonly clearly visible across the sky, and on a good night and with a bit of luck you will see shooting stars. With 10,582km², more than 10 billion tons of salt and containing up to 70% of the world’s lithium reserves, Salar de Uyuni is the world’s largest salt flat, a vast salt plain at the Andes of Bolivia. 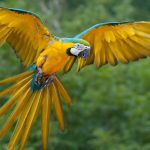 Heading to South America? 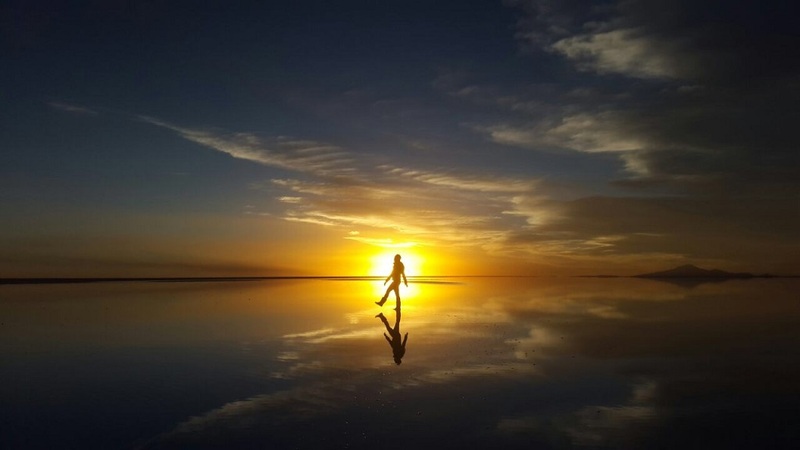 Then even if you only have time to do one single thing in South America this should be it: A visit to the Uyuni salt flats. Not being able to come just yet? Then you should definitely add it to the very top of your bucket list! 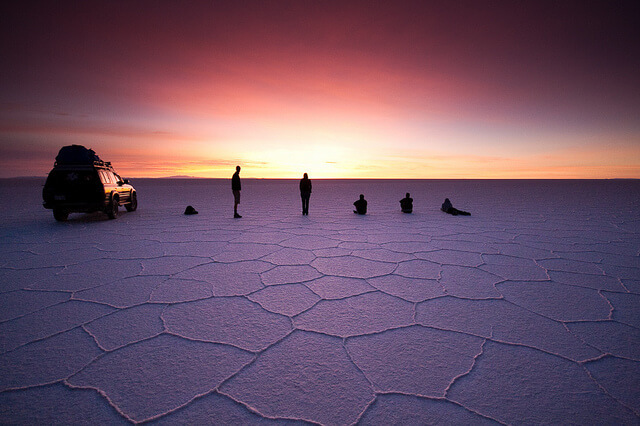 Stargazing – Drop off in Uyuni or your salt hotel in Colchani. Private transport in a 4×4 with oxygen tube. Guide (English speaking guide available at extra cost). Rain or waterproof boots (important item! to walk “on” the water). Sun glasses (the sun’s rays on the surface of the salt desert creates a dazzling, blinding light. It’s therefore indispensable to wear high protection sunglasses.). stargazing planner for your night out with the stars at the Uyuni salt flats. Please contact us in advance for more information. 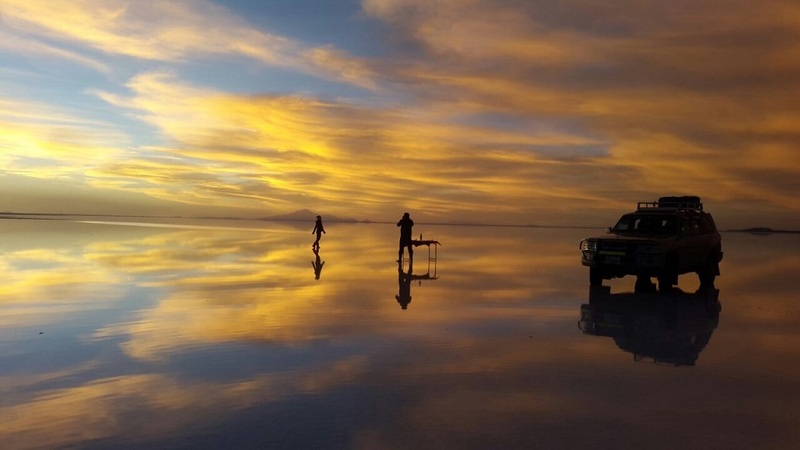 A comfortable 3 day Uyuni – Uyuni Tayka tour, with Tayka hotels or in combination with similar category Luna Salada Salt Hotel & Spa or Hotel Palacio de Sal. 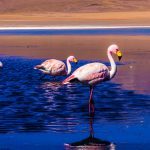 A basic tour on the Salar de Uyuni, with basic hostels and private transport only.